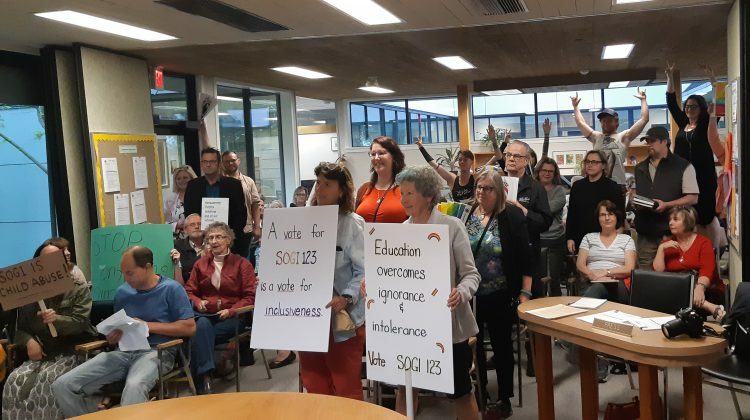 A large group of concerned citizens, both in favour of and opposed to SOGI 123, at the May 8th SD72 board meeting. 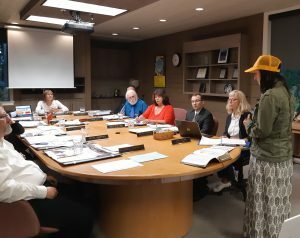 CAMPBELL RIVER, B.C- The Campbell River School District 72 meeting saw mixed responses last night as the board voted on the controversial sexual education materials, SOGI-123. Sexual Orientation and Gender Identity (SOGI) is an initiative aimed at educating students and teachers on issues regarding gender and sexuality in school children. The program has provoked heated debate throughout the province as well as in Campbell River. The room was filled with both supporters of and those against the SOGI 123 initiative, the majority of each entered through different doors. At the start of the meeting, board chairperson Susan Wilson reminded attendees to be respectful. Richard Franklin was the first trustee to speak, and began by addressing the concerns the board had heard about the intentions of SOGI 123. “Some suggest that homosexuality is a sign of mental illness or a dangerous lifestyle, or that the LGBTQ community is conspiring to recruit children,” he said, which caused some quiet laughter from the crowd. “I respect people’s rights to have these beliefs. But I do not subscribe to this point of view. Franklin went on to submit his support for the motion. “Despite the threat to be unseated in the next election, I will not make decisions that I feel are contrary to the governance model of this school district,” said Franklin. Trustee John Kerr also mentioned a threat to be unseated. “In part the letter stated that the Canadian Christian Lobby would attempt to defeat any trustee who did not actively oppose the use of SOGI material,” said Kerr. Around the table, trustees voiced their thanks to those who had shared their beliefs and created a worthwhile conversation, before announcing their support for SOGI 123. There were mixed reactions to the school board’s final decision. Of the three public presentations that followed the decision, only one was in support of SOGI. Mary Malinski, the mother of a bullied child, gave an emotional thank-you to the board for their approval. Vanessa Maclean reads from a Bible at SD 72 board meeting. Vanessa Maclean, the organizer of an anti-SOGI event two weeks ago, read from a Bible during her five minute presentation, highlighting where it disapproved of homosexuality. Another speaker, Christian Michael, said he would be continuing to oppose SOGI and would be submitting reports to the board. One woman, who did not want to use her name, yelled at the board as she left, saying they were not listening to the parents. 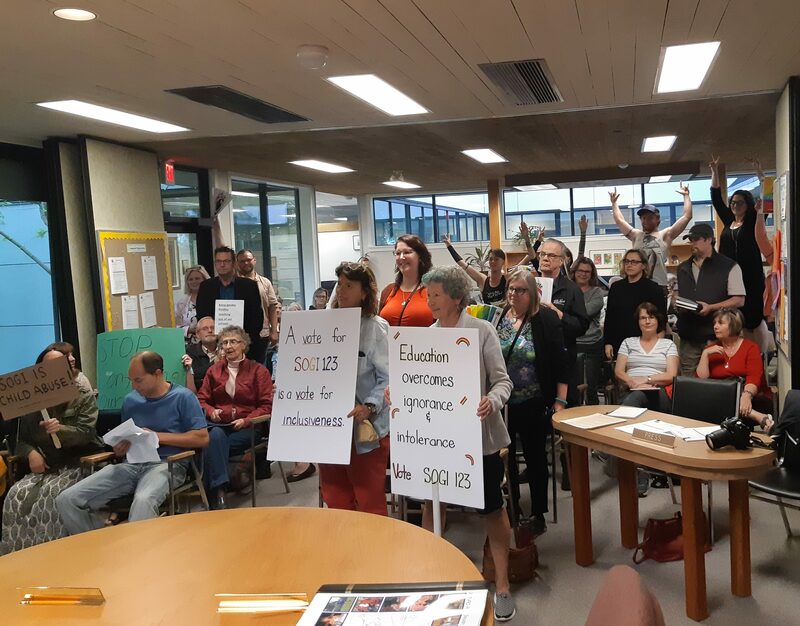 When her shout provoked a round of applause from the anti-SOGI attendees, those supportive of SOGI responded by loudly exclaiming thanks to the school board. According to Susan Wilson, the school board could no longer afford time to public submissions at school board meetings on the subject of SOGI 123, as they have other duties to attend to. The school board can reached directly to answer questions or for written submissions.